I am starting a new series about preparing jams, jellies, squashes and sauces. These are readily available in the market and will be better than what we make at home. However, making these at home though laborious, will be economical, though time consuming too. They are hygienic and can be made according to our taste. Also knowing how to prepare these will help us so that when we do not get these, we can utilise that knowledge. Since we will be using jams and jellies daily, I am discussing those in detail and others in brief. Morabba is also known as murabba which is just a thick jam and is normally prepared from mangoes, even though some make from straw berries and cherries. Squash is nothing but fruit juice in concentrated syrup. It is non-alcoholic. It is made mainly from citrus fruits as well as mango. Commercial ones may not have complete fruit juice but a portion of it as well as sugar syrup and essence of the fruit and colour. It is used as a softy drink, especially in summer season. Sauce is a semi solid preparation usually from tomato combined with chilly. It is usually taken along with savouries, bread toasts, chapattis, stuffed parattas etc. Jams and jellies are used as sweet spreads over bread slices and toasts and liked by children for chapttis. For this normally fruits that are unsuitable for canning or freezing are used. All contain the four essential ingredients needed to make a jellied fruit product–fruit, pectin, acid and sugar. They differ, however, depending upon fruit used, proportion of different ingredients, method of preparation and density of the fruit pulp. Jelly is made from fruit juice and the end product is clear and firm enough to hold its shape when removed from the container. Jam is made from crushed or ground fruit. The end product is less firm than jelly, but still holds its shape. Both can be made with or without pectin and preservatives. Fruits naturally furnish the flavour and part of the needed pectin and acid. Generally use only ripe fruits but not too ripen one. You can use partially unripe fruits. Similarly avoid spoiled, mouldy (infested by fungus) or stale fruits. Pectin is the actual gelling substance. The amount of pectin found naturally in fruits depends upon the kind of fruit and degree of ripeness. Unripe fruits have more pectin; as fruit ripens, the pectin changes to a non-gelling form. Usually using 1⁄4 unripe fruit to 3⁄4 fully-ripe fruit makes the best product.Cooking brings out the pectin, but cooking too long destroys it. High pectin fruits are apples, crab apples, quinces, red currants, gooseberries, Eastern Concord grapes, plums and cranberries. Fruits lower in natural pectin include blueberries, peaches, apricots, pears, raspberries, blackberries and figs. These low-pectin fruits should be combined with one of the high-pectin fruits or with commercial pectin. When commercial pectin is added, fully ripe fruit can be used. The use of this added pectin also increases the yield from a recipe. Jams and jellies may be made from low pectin fruits using the recipes specially given in this series that do not call for adding commercial pectin, but they may not gel properly every time. Commercial pectins come in liquid and powdered forms. Both give satisfactory results, but the amounts of ingredients per package and the methods of adding recipe ingredients differ. For this reason, the powdered and liquid forms are not interchangeable. Be sure to follow the manufacturer’s recipes and instructions. Store pectins in a cool, dry place and use before expiration dates on the packages. Pectin found naturally in fruits or in regular commercial pectins will not gel without a certain amount of sugar. To make gelled spreads without added sugar or with reduced sugar, modified pectins must be used. Currently there are special pectins available to make jellies and jams with either no added sugar or with 1/3 less sugar than regular recipes. Follow the recipes provided by the manufacturer with each type of pectin. The sugar is required for all the recipes posted in this series. Acid is needed for gel formation and flavour. The amount of acid in fruits also varies with the fruit and degree of ripeness. When using low-acid fruits in recipes without commercial pectin, add lemon juice or citric acid crystals as directed. Sugar helps form the gel, serves as a preserving agent, firms the fruit and adds flavour. Beet or cane sugar can be used. 1. Sort fruit to remove the overripe or the undesirable. Wash fruit in cold running water or by lifting from several changes of cold water. Do not remove cores or skins, since the pectin is more concentrated in these portions. 2. Prepare fruit for juice extraction as directed in a recipe. Extracting juice differs with different kinds of fruit. Juicy berries can be crushed and the juice pressed without heating or the fruit can be heated until soft. Firm fruits need to be cut up and heated in a small amount of water to start the flow of juice. 3. You must allow the juice to filter through of its own accord through fine filter made of several cheese cloth or fine filters. The clearest jelly comes from juice that drips through this strainer or filter without pressing, but there is more juice when the bag is twisted tightly and squeezed. If this is done, the pressed juice should be re-strained through a double thickness of damp cheesecloth. 4. Measure the required amount of juice into a large sauce pot. Make only a small batch of jelly at one time–about 4 to 6 cups of juice. Excess juice can be refrigerated for a few days or frozen, to be made into jelly another time. 5. The amounts of other ingredients and when to add depend upon the presence or addition of pectin. If the juice is low in pectin, use commercial pectin and follow the directions on the package. 6. Determine if the fruit has enough acid. If your fruit juice does not taste as tart as lemon sherbat, it is not tart enough. Add 1 tablespoon lemon juice or 1/8 teaspoon citric acid crystals to each cup of fruit juice. 7. Add sugar as directed in recipe. 8. Cook the jelly. If liquid or powdered pectin is used, follow manufacturer’s instructions for that pectin. Be sure to start each season with fresh, newly purchased products. If no pectin is added, then a longer boiling time is necessary. Stir frequently to prevent sticking and scorching. Continue cooking until done, but do not overcook. 9. Test for doneness. A big challenge in making jelly without added pectin is to know when it is done. Refrigerator test: Pour a small amount of boiling jelly on a plate. Put it in the freezing compartment of the refrigerator for a few minutes. If the mixture gels, it should be done. Remove jelly mixture from the heat while conducting this test, otherwise the mixture will overcook. Spoon or Sheet Test: Dip a cool metal spoon in the boiling jelly mixture. Lift the spoon above the kettle out of the steam. Turn the spoon so syrup runs off the side. If the syrup forms two drops that flow together and fall off the spoon as one sheet, the jelly should be done. There are some differences between making jams and making jellies, although the basic ingredients–fruit, pectin, acid and sugar–are the same. Unless you are using a fruit known to be high in natural pectin, you will need to use a pectin-added recipe. Do not use a blender or food processor to prepare the fruit. Either finely chop fruit as described in the recipe, or crush with potato masher or other method that does not mix air into the fruit. Stir fruit mixture over low heat until sugar dissolves. Then boil rapidly for a sparkling finished product. As the fruit mixture begins to thicken, stir frequently to prevent sticking and scorching. For a softer product, shorten the cooking time; for a firmer product, lengthen it. 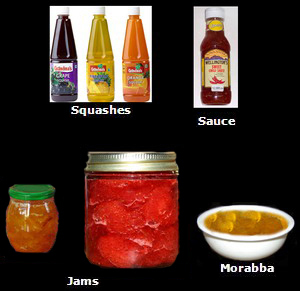 The refrigerator test described under making jellies can also be used for jams. Remove the cooking jam from the heat while conducting this test, otherwise the mixture will overcook. Before filling jars, quickly skim ¼ teaspoon butter or margarine during cooking helps cut down on the foam formed. If liquid or powdered pectin is used, follow the manufacturer’s directions. The method of combining ingredients varies with the form of pectin used. Pectin, acid and doneness tests are not used with added pectin. This entry was posted on February 26, 2012 at 10:36 pm and is filed under Jams, Morabbas, Squashes and Sauces with tags Jam, Jelly, Morabba, pectin, sauce, squash. You can follow any responses to this entry through the RSS 2.0 feed. Both comments and pings are currently closed. Hello, Thanks for your post, it was really informative. I’ll be looking forward for your next post….